The highly anticipated luxury, all-suite Delano Las Vegas has debuted, bringing a touch of South Beach to The Strip. Executives and employees of MGM Resorts International and Morgans Hotel Group gathered recently to officially unveil Las Vegas’ newest hotel. 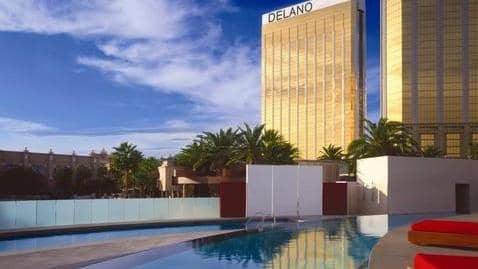 “Delano Las Vegas marks a new chapter in the Las Vegas hotel experience, ushering in elevated levels of personalised service, style and attention to detail,” says General Manager Matthew Chilton. Intimate and stylish, Delano’s public spaces immerse guests in a welcoming ambiance punctuated by eclectic, playful details and a modern sensibility. Complemented by sophisticated accommodations, the non-smoking, non-gaming hotel appeals to discerning travelers from around the globe.